Vancouver, British Columbia--(Newsfile Corp. - July 5, 2018) - Pacific Empire Minerals Corp. (TSXV: PEMC) ("Pacific Empire", "PEMC" or the "Company"), a hybrid prospect generator focused in British Columbia, announces that following the completion of its Phase 1 reverse circulation ("RC") drilling program at the Wildcat Property it has now mobilized to its Kitimat Copper-Gold Property where drilling is underway on the Jeanette target area. The Phase 1 Drill Program consisting of 11 holes of reverse circulation drilling, totaling 550 metres, has now been completed in the northern portion of the property that targeted three areas. All drill samples were screened in-house using the companies X-Ray Fluorescence ("XRF") spectrometer. Although anomalous copper was encountered, the XRF results showed intervals not deemed of significant grade and width to send to the laboratory for analysis at the three target areas tested. 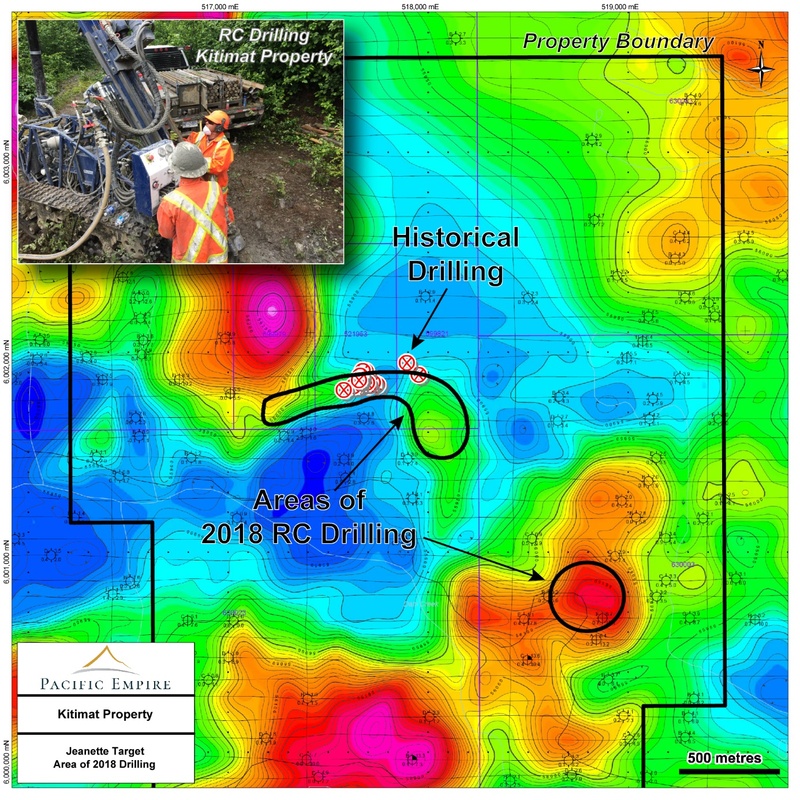 "The results of Phase 1 drilling at the Wildcat Property are being reviewed and future exploration will be planned accordingly," commented Pacific Empire's President and CEO Brad Peters. "We intend to test as many targets as rapidly and cost effectively as possible in order to prioritize each of our projects for further reverse circulation drilling and exploration programs during 2018." Following completion of drilling at the Wildcat Property, PEMC has now mobilized to the Kitimat Property where historical drilling encountered copper and gold at the Jeanette target area. An initial program at the Jeanette target area, of five to ten RC drill holes is underway. The objective of the program is to determine the potential for additional mineralization outside of the mineralized zones using historical soil sampling and airborne magnetic surveys to guide exploration. Additional information on the Company and its projects can be found on SEDAR at (www.sedar.com), and on the Company's website at www.pemcorp.ca. You may also email info@pemcorp.ca or call Investor Relations at (604) 356-6246. PEMC is an exploration company based in Vancouver, British Columbia, that employs a "hybrid prospect generator" business model and trades on the TSX Venture Exchange under the symbol PEMC. The Company's strong portfolio of projects is a result of continuous generative work conducted since the Company's inception in 2012.